The TC 238 is ideal for homeowners and landowners with larger gardens who need a durable and comfortable tractor with high manoeuvrability. It is an efficient garden tractor that offers excellent collection of grass clippings as well as leaves, giving tidy cutting results. The spacious, integrated collector is easily emptied from the driver’s seat. 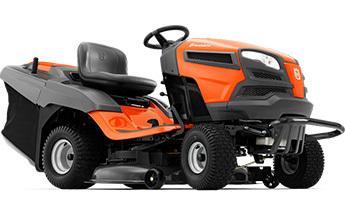 Equipped with a powerful Husqvarna Endurance Series engine, including choke less start, as well as pedal-operated hydrostatic transmission and cast front axle for extra convenient and trouble-free operation. BioClip® plug is included and a deflector for rear ejection is available as an accessory.